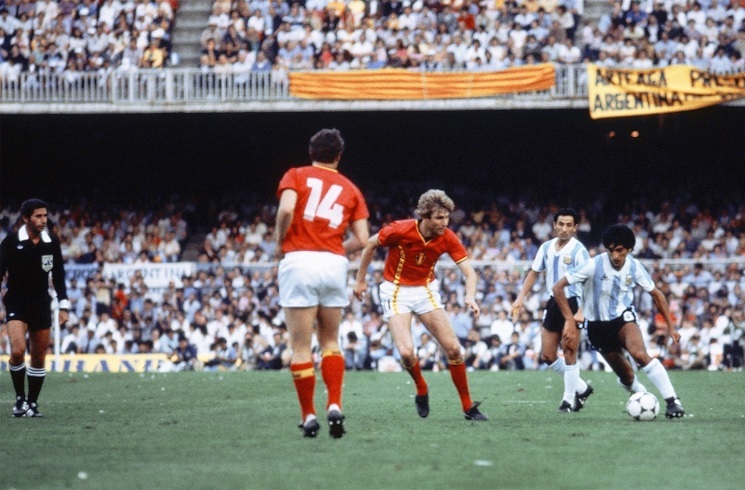 Argentina versus Belgium at the 1982 FIFA World Cup. We are just 30 days until the start of the FIFA World Cup and in 30th place we have Argentina losing their opening match of the 1982 FIFA World Cup. Looking back, it was maybe an omen. June 13, 1982, reigning FIFA World Cup winners Argentina took to the pitch at the Camp Nou in Barcelona to play Belgium. Lead by captain Daniel PASSARELLA, coach Cesar Luis MENOTTI stayed on after having the tournament four years prior and made a big change to the team. Diego MARADONA was now wearing the number 10 shirt for his country and big things were expected of not only him but of the team. But the opening match could not have gone any worse. A narrow 1-0 loss to Belgium mixed with a massive 10-1 win by Hungary over El Salvador saw Argentina start the tournament in third place in their group.